Photos by Daniel Melchior: click on the picture to view full screen and then use your back button to return. The hedgehog scurried around at the side of the road and then disappeared into the bushes. Meanwhile, a man in a full Black Tie dinner suit walked down the hill towards me, looking at his phone, which cast an eerie light on his face and made him appear to be a moving head with no body! It was 2.09am on Saturday 21st June 2015 and a bizarre beginning to a ludicrous episode in my life as a cyclist. I say ludicrous because I was planning to ride up this hill 100 times, before heading home to bed c.24 hours later! a successful Everesting admits you to a global group of similarly minded cyclists known as ‘Hells 500’. There is no easy way to become part of Hells 500. OK, which hill should I go for? I fitted straight into the final category: in fact I found the whole ideal utterly compelling. I loved the simplicity of the challenge, the idea of an uber-long day and lots of climbing and the logistical demands involved in the planning. At that point, back in 2014, I knew just five people who had attempted an ‘Everesting’. Only two had succeeded and only one of those at the first attempt. All were ‘elite’ cyclists, so this was clearly no easy task and I considered myself duly warned. I was told quite clearly that the most important choice to be made was ‘which hill?’ A steep one meant a shorter overall distance and therefore less time, but involved using more power, so the chance of physical failure would be higher. A gentler gradient might feel easier on the body, but would dramatically extend the total distance to be covered, meaning a very long day and a harder mental challenge. To put that into perspective, an Everesting involving less than 200km total distance would be considered steep, whereas one taking 400km would mean using a much gentler hill. Besides the hill itself, I was told to consider prevailing winds, daylight hours, seasonal weather etc. 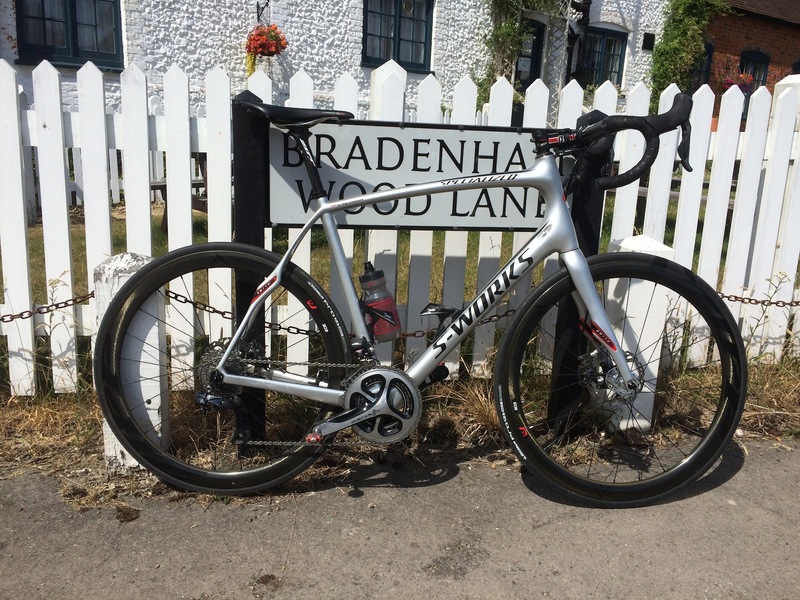 The bottom line was that an ‘Everesting’ was likely to be one of my hardest days ever on a bike, so I set about planning it really well in an attempt to load all the odds in my favour. 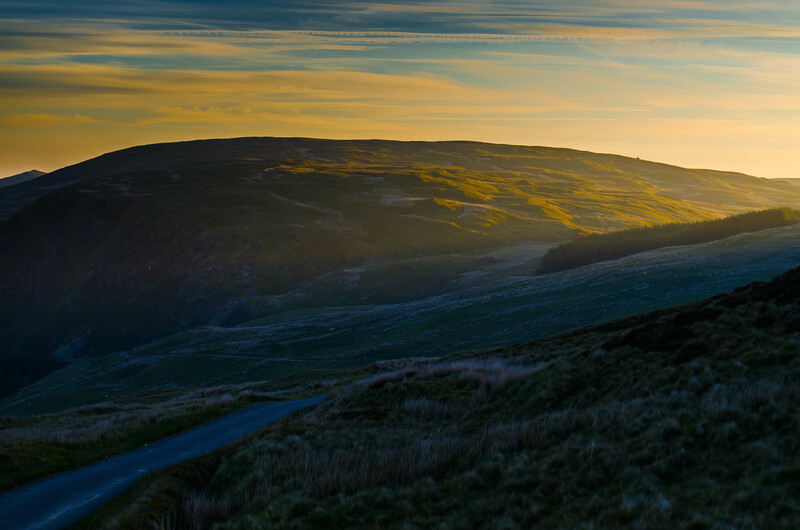 Chapter One: the north side of Bwlch y Groes, Snowdonia. I recced ‘my hill’ in December 2014. It was in Wales and for the UK, it was high and long. Logic told me it was too long really, but it was one of my favourite climbs and I decided to be philosophical about the time I’d spend on it: climbing Everest was an epic endeavour and the cycling equivalent should be properly hard too. In practice, things went wrong even before I got to the start line. On the first drive up the M40 on 10th June, with a photographer friend, Daniel, in the passenger seat, I realised I’d forgotten my spare Garmin and the charging cables. 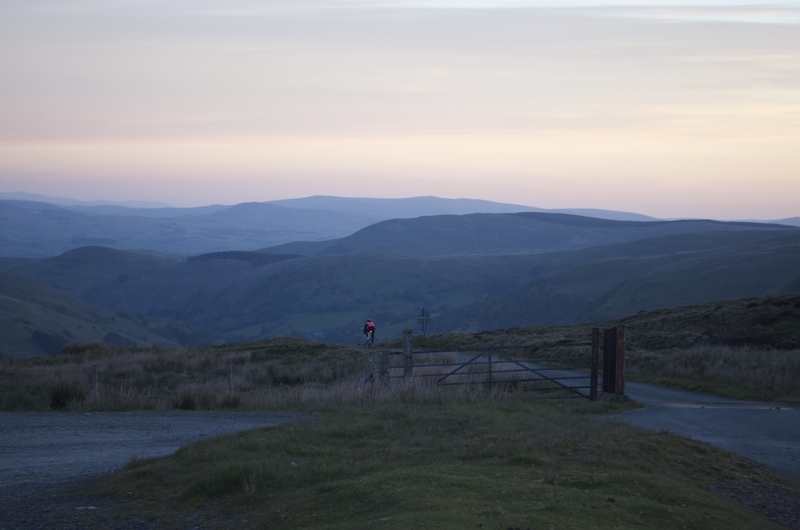 Some quick mental maths told me that by the time we’d returned home and then driven back up to Wales, it would be c.3.00am – much too late – so we postponed for 24 hours. But fate was still against me, or rather a lack of local knowledge was. The wind was due to be light and from the east. At worst, I thought that would mean a cross wind on the upper part of the climb. We arrived in the pull-out at the top of the hill around midnight and set up our gazebo, under which I planned to sleep until starting around 5.00am. But we struggled to even erect it – the wind was strong and seemed to have a lot more south in it. In the end we had to tether the gazebo to the car, but then the car started to move, repeatedly setting off the alarm! It wasn’t a relaxing night! I awoke, bleary eyed, in the cold light of pre-dawn. The moon was still in the sky, but there was a faint glow in the east. I dressed quickly, munching on a Bounce Ball and Daniel took some photos as I headed down into the semi-darkness. It was 4.52am on 12th June. Time to get going – 4.52 am! It was cold – around four degrees centigrade. But I was still optimistic and the first few laps felt OK. I tried not to think about the overall task ahead – it was just too daunting: at 8.5km long, my climb would give me 450m of ascent. So a lap was 17km and I needed to do 20 of those to hit the height of Everest, which would require a total distance of 340km. Heading down to the bottom of the climb, 8.5km away, to start the first lap. 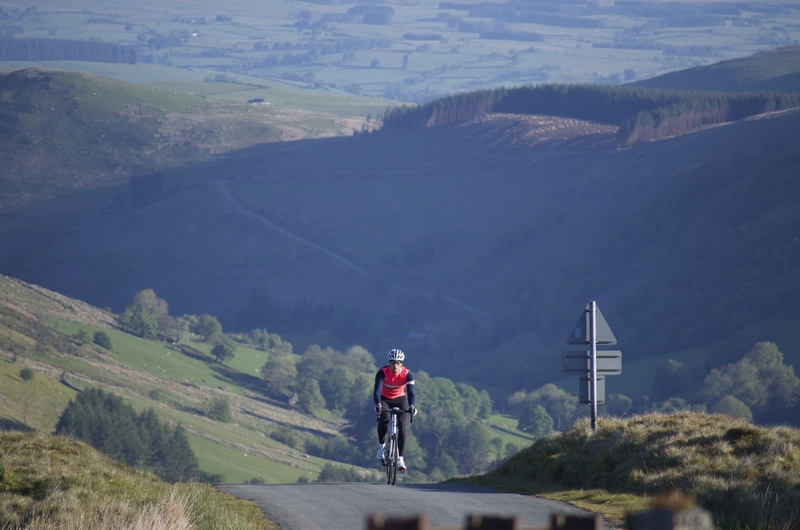 I’d picked this climb because it was beautiful – it was probably my favourite climb in the whole of the UK for scenic appeal and it had the aesthetic advantage of ending at the top of the highest paved road in England and Wales. It rose in three distinct sections from a small village at the south-east corner of Lake Bala in the Snowdonia National Park: after a short 15% ramp, the valley stage rose gently for the first 4km, then the steep wooded section at 15 – 20% for a kilometre or so and then the open upper mountainside, with numerous sharp 20% ramps. I realised about four laps in that, beauty aside, I’d made various mistakes: the gradient of the climb varied constantly, so I was struggling to find any rhythm, the descent was very technical, so there was no respite, or chance to eat and drink while going down and finally, my summit camp was a poor choice – arriving at the top, hot and breathless, the last thing I wanted to do was stop and eat. The camp should categorically have been at the bottom of the climb. There was a worse problem though: the wind. It wasn’t quite gale force, but it was certainly strong. There was a little more south in it than I’d expected and it was deflecting off the mountainside and funnelling straight down the valley, meaning I was fighting a headwind, constantly. It was very cold, but the light was stunning and I had the road all to myself. I started to do some mental maths. I had worked on the basis of a 45 minute lap. But the wind was adding fifteen minutes to that. Which would mean an extra four hours at least, as the day wore on and that was without trying to guess how much extra energy I was using and how that might further affect my lap times. Just working away at it – lap four. After seven laps and with just 3,000m on the Garmin, I climbed off the bike, conceding defeat. Physically, I felt fine, but the extending time frame would mean riding right through the whole of the coming night and I didn’t have enough battery power in my lights for that. Daniel helped me pack up the camp and we drove home, with my mind working overdrive, processing all the lessons learned, notably, that I’d picked a tricky climb, that lack of local knowledge had left me fighting a headwind and that a summit camp was a very bad idea. Conceding defeat – this was my final lap before climbing off the bike. I was like a dog with a bone and within a few days of returning from Wales, I decided to try again. I did however make one significant change to the plan – I chose a different climb: I have a local climb in the Chiltern Hills that I use for running hill repeats: it’s 2km long, rises 90m and the gradient is pretty gentle and constant – around 6 – 7% for most of its length. 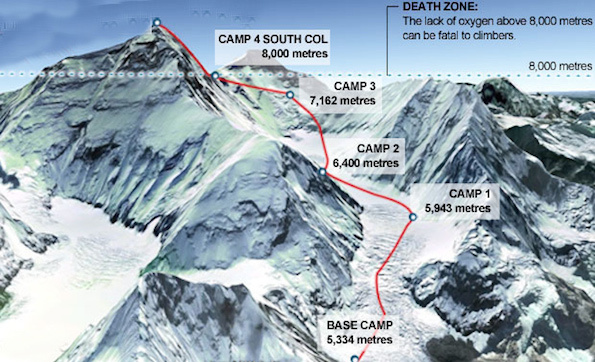 If I ran 100 laps on it, I’d hit 9,000m (Everest is 8,848m, but I decided to play safe). I knew from my hill sessions that 10 laps took me roughly two hours, so my riding time would be c.20 hours. 100 laps would mean a distance of 420km. I rolled away from my car (at the bottom of the climb this time), at 2.09am. It was around 10 degrees centigrade and there was barely any wind at all. I climbed up through Bradenham Woods, assuming that the first three or four hours would mean deserted roads, but bizarrely, I found a crowd of people at the top! There’s an RAF base at the end of the climb and their Midsummer Ball was just ending. Women in ball gowns were sitting on the grass, waiting for taxis and coaches and there was a constant stream of traffic. I must have been a bizarre sight, riding up and down this hill, but no one asked me what I was doing – they just stared at me through an alcoholic fog! Eventually the revellers all faded away to their beds and I was left in the dark wood, with just the hedgehog to keep me company. It was a little chilly, rain threatened and in truth, I wasn’t feeling all that great, but my legs seemed to settle into it and I tried to lose the butterflies in my stomach. There was no getting away from the fact that success was only likely to come at a price: at 420km, I’d be 70km past my previous longest ride; if I was right about the predicted 20 hours riding time, that was seven hours longer than ever before and at 8,848m, I was going uphill for another 3,000m versus any former personal records. The final ‘big deep breath’ realisation was that Everesting this hill was going to require riding uphill for 210km. The scale of the task ahead was really weighing down on me. Dawn arrived early and by 4.00am, I no longer needed lights. A flock of Red Kites – some 20 of them in the end – slowly gathered on the cricket pitch beside the bottom of the climb, over the space of five laps or so and then suddenly they all left, to where, I couldn’t fathom. In an attempt to break the climb down into palatable chunks and also to add a touch of realism to the endeavour, I’d worked out the number of cumulative laps of my climb required to hit the various heights on the way to the real summit of Everest. 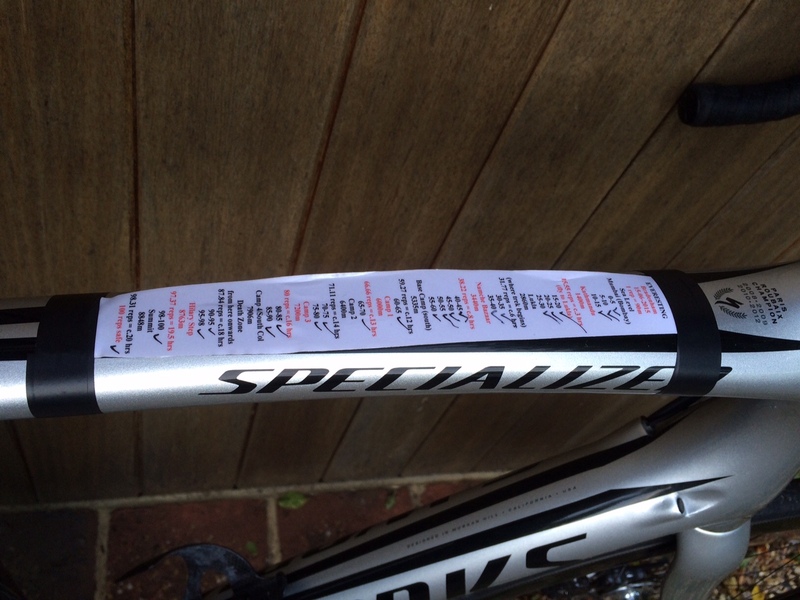 This was taped to my top tube and was undoubtedly the scariest top-tube sticker that I’d ever put there. The first real milestone was at 2,860m, which was the height of Lukla, where the trek to Everest Base Camp begins. For me, this would be 32 ascents of my hill, which was likely to involve six hours in the saddle! Manageable chunks, or just really scary? Initially I seemed to make good progress, not stopping at all for the first 11 laps, but then I had numerous delays caused by the need to eat, refill my bidons (bottles) and numerous other small tasks that needed attending to, meaning that I was an hour behind my schedule by the time the number 32 flashed up on my lap counter. It was 9.00 am and it had now been raining lightly for a couple of hours. Little did I know that the rain would last for 12 hours in total! The rain wasn’t my only problem though: I was losing time not on the laps, which were bang on schedule, but in the stops. I was eating every one to two hours, but other small things like adding air to my tyres, recharging Garmins, lubing my chain, preparing food, etc., were all taking time and with each stop, my eventual finishing time just got further and further away. 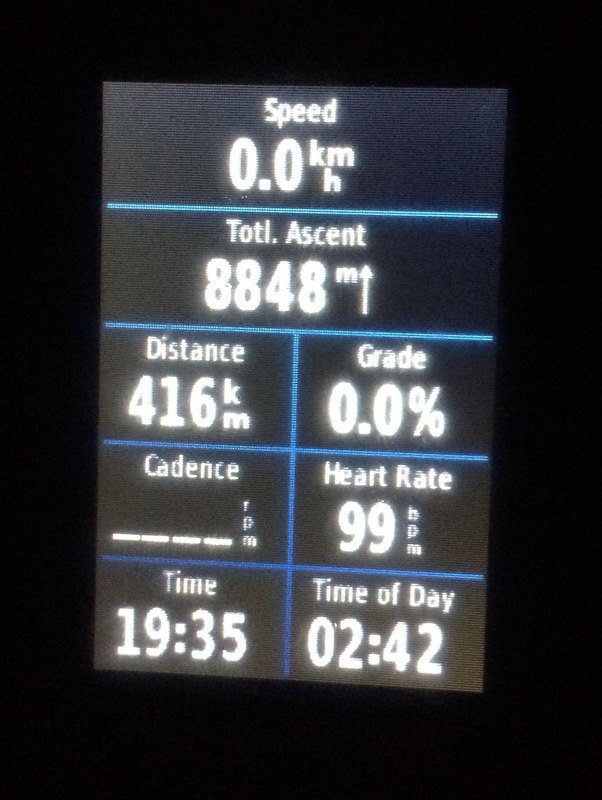 The really big milestone in my mind was reaching Base Camp at 5,335m – 60 laps of my hill! In theory, this would take me c.12 hours, but with stops, it ended up taking me just over 14 hours. I listened to a couple of audio books with a headphone in one ear, but in reality, I wasn’t bored and I found that I rode better when my mind was focused on the job. Instead, I watched pieces of a cricket match from start to finish on the pitch next to the road as I rode repeatedly by! Around 8.00pm, my boys arrived on their bikes and rode a couple of laps with me. It was around this time that my bottom bracket died and I had to switch bikes (I had a spare bike in the car). My wife and daughter dropped by with coffee and a bacon roll around 9.00pm, both of which tasted wonderful. Jenny asked me whether I could do it, to which I replied simply “yes”. I also told her that I now realised how high the ‘barriers to entry’ were for an Everesting. This was turning into a ridiculously long day. 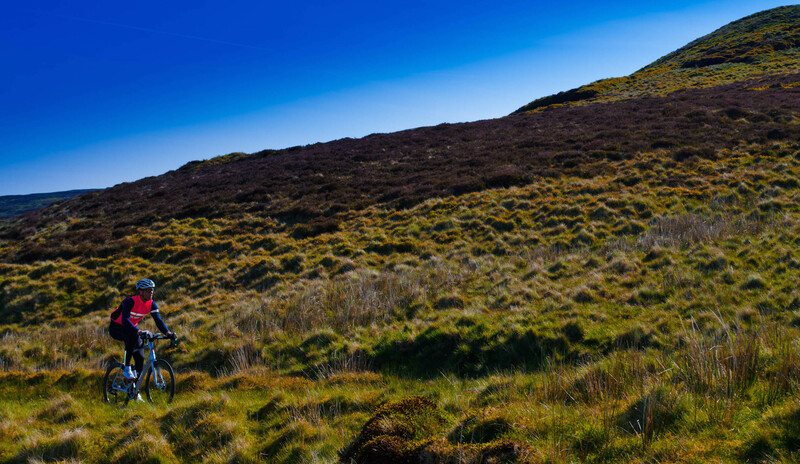 One of the difficulties of Everesting is that any time lost simply can’t be regained. So, as evening arrived, I did the maths again and realised that I was looking at a finish time well beyond midnight. I climbed though Camp 1 (6,000m/67 laps), then Camp 2 (6,400m/71 laps) and Camp 3 (7,200m/80 laps) and then finally I reached the South Col, or Camp 4, at 7,906m (88 laps). It was now well past midnight and I had the road to myself again (along with the same hedgehog I’d met the night before)! At 97 laps I reached the Hilary Step (8,763m), where Sherpa Tenzing Norgay and Sir Edmund Hilary struggled on the first ascent in 1953 and then, on lap 99, halfway up the hill, the magic figures flashed up on my Garmin: 8,848m. It was about 2.30 am, so I’d been on the go for a little over a day. I did one more lap to be safe (you can’t rely on a Garmin for 100% accuracy) and also because 100 seemed like a much better finishing number than 99! At 2.45 am, I packed the bike back into my car and drove home to bed. I had been visualising my bed for the last ten hours or so and it was the most welcome place in the world at that moment. I slept for four hours before my body clock woke me up! HELLS 500: entry via blood sweat and tears. In the following days, I realised just how hard this ride had been: my toes were slightly numb and I was DEEPLY tired. Crucially however, I was mechanically sound and I’d not had to ride through pain at any point. It took me about four days to start feeling normal and well over a week to find my legs. Manageable chunks, or just really scary? My top tube sticker. The problem was obvious: with an average gradient of 14%, this new hill would be completely unlike my previous Everesting. 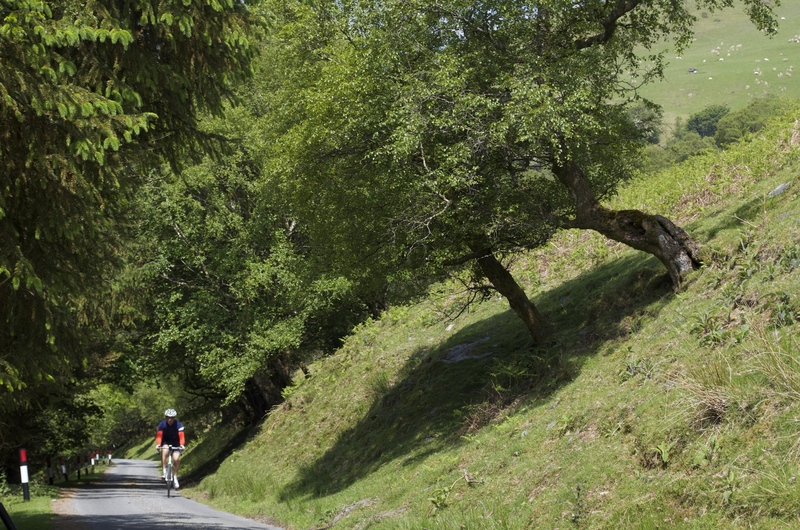 9,000m of ascent would involve riding just 135km! So, 67.5km at 14%…??? Much of the climb hovered around 20% and the maximum gradient was somewhere around 30%. 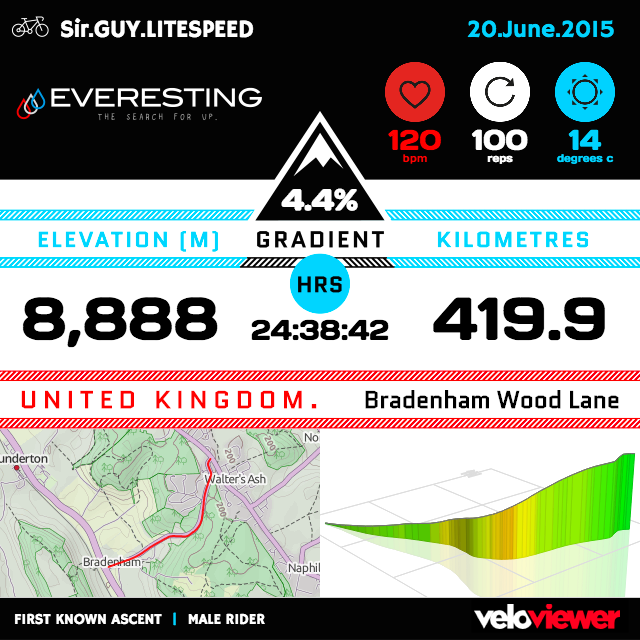 If successful, this would be one of the shortest Everesting’s ever undertaken. I called Simon Winfield, the owner of my local bike shop, Cycle Care and shared the problem with him. I emailed him a copy of the climb profile too. We talked about various schemes to achieve lower gearing and debated which bike I could modify. Various ideas all led to dead-ends. In the end, Simon had a conversation with the technical guys at Shimano, who came up with a blissfully simple solution: road Di2 is compatible with XTR Di2 (the off road equivalent gearing), so if I replaced the rear derailleur, the chain and the cassette on my S-Works, I’d have a bottom gear of 34 x 40. The fact that I’m still not certain that’s low enough is testament to how steep the Project H hill is…. only time will tell. I’m aiming at early May 2016 and have recruited an accomplice – Kev Mellalieu. More news to follow… SGL, Feb 2016.